Did this exchange ultimately quicken Princess Diana's interest in Middle East Peace? 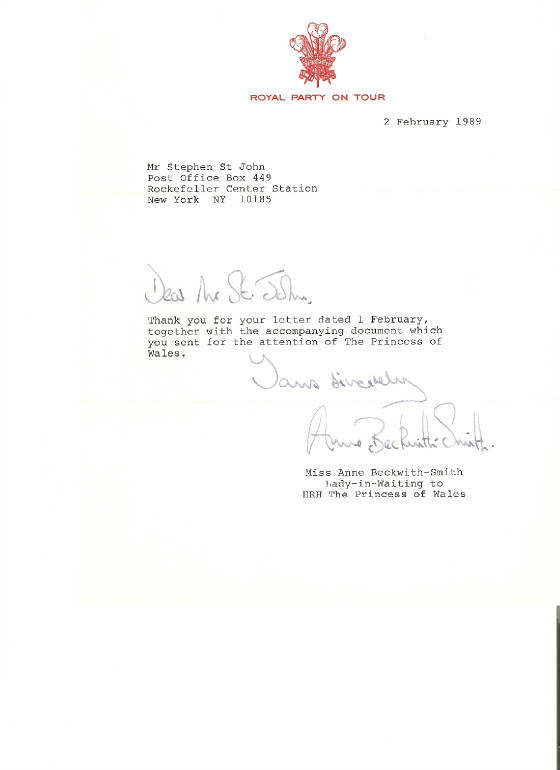 Below is a copy of a note dated 2 February 1989 from Miss Anne Beckwith-Smith, Lady-in-Waiting to HRH The Princess of Wales, in which she acknowledged receipt of my letter and “accompanying document” (my Eight Part Peace Proposal for Greater Jerusaelm) which I had hand-delivered the previous day to the concierge at the Plaza Athenée Hotel where Princess Diana was staying during her visit to New York City. As I exited the hotel that day, I was accosted in the lobby by a tall gentleman with blond hair and blue eyes who identified himself as an official with the US Department of State. He asked me to identify myself and state the purpose of my visit, and I complied. After making a few jottings in a small notebook he thanked me and I left the hotel. Years later, on her final visit to New York City in 1997, Princess Diana made a sudden and unexpected late night personal visit during which we had an approximately 20 minute conversation about my peace proposal inside an automobile that she had parked near my residence on the Upper East Side of Manhattan. Already bowled over by her magnificent gesture, I was doubly delighted to discover that she had read my peace proposal and could speak about it and refer to it from memory! The Princess asked me about verses 8 and 9 of Chapter 8 of the Song of Solomon, the latter of which I had inscribed onto a map in my peace proposal: “8 We have a little sister, and she hath no breasts: what shall we do for our sister in the day when she shall be spoken for? 9 If she be a wall, we will build upon her a palace of silver: and if she be a door, we will inclose her with boards of cedar.” I explained to her that the Song of Solomon is an allegorical history and prophecy of the people of Israel, and that in these verses our little sister refers to Islam. When the Princess and I met, I had never heard of Dodi Fayed or his relationship with her, though all the news and speculation about them was soon to follow.